Luke Fitzgerald thinks that an advantage in the forwards will see Ireland end their Six Nations on a winning note against Wales in Cardiff. Joe Schmidt's side have an outside chance of retaining their crown this weekend, but require a win in Wales coupled with Scotland either winning or drawing against England at Twickenham. The prospect of Ireland winning the Six Nations title appears remote, but Fitzgerald thinks that Joe Schmidt's men are well placed to scupper Wales' bid to win a third Grand Slam under Warren Gatland. Speaking on The Left Wing, Independent.ie's rugby podcast in association with Aldi, Fitzgerald paid tribute to Gatland's ability to prepare his team for Irish challenges over the year. "What Wales have been able to do is appreciate the strengths of the Irish team," Fitzgerald said. "They have gone after Ireland in the air. They have great cohesiveness in the group. "They are really difficult to play at home. It's the best stadium to play in." 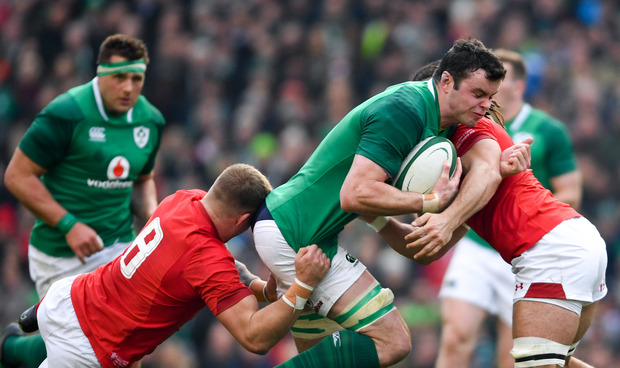 It was a return to form for Ireland against France at the Aviva Stadium last weekend, with the Irish forwards winning the collisions against the visitors. Fitzgerald says that another huge effort is needed from the forwards if Ireland are to prevail against Wales. "The pack need a massive one," Fitzgerald added. "They need an absolute monster. We can't break them down with just one-out runners, that will not work against these guys. We need to be brave. "We have a better pack than them. I'm convinced of it. I'm absolutely convinced by it." Wales are narrow favourites with the bookies but Fitzgerald is backing Ireland to finish their Six Nations campaign on a high. "I think we will do the business," Fitzgerald said. "This Welsh team are very good and excellent at home, but we are better. I think we might have peaked just in time. I'm hoping this will be a big confidence boost going into that stretch with the clubs and then those internationals in the summer. Ireland will need to be brave, they will need to play. The forwards will need to play under pressure from great line-speed from the Welsh team and pressure around them because they won't be able to hear each other. "And we need to take chances. We've nothing to lose at this stage, second or third in the championship doesn't really matter." However, despite predicting an Irish victory, Fitzgerald thinks that England will lift the Six Nations trophy after beating Scotland at home. "Scotland have shown nothing really," Fitzgerald said. "They are plucky and hard to beat - but you always beat them. I don't expect them to do us any favours in Twickenham. The last time they won there was 1983 so a long time ago and I don't expect that to change."